Interests - Watching tv and DVDS, audio books such as Jaqueline Wilson and other girlie authors, swimming, painting, sticking glue glitter and messy craft stuff, any craft or making things activities, jewellery, anything pink and sparkly, girlie stuff, make up, Disney movies, Bratz, High School Musical, loves Hannah Montana, Nintendo ds girlie games. 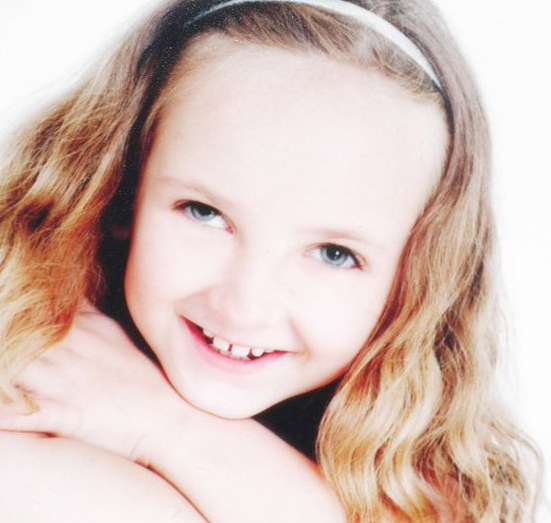 Niamh has had various health problems since early childhood. She was born with a condition known as CHOANAL ATRESIA which meant that at birth she was unable to breathe through her nose. This meant that at one day old she needed surgery to help her breathe. Over the next 3 and a half years she had 9 more operations on her nose and was eventually able to breathe through it. At that time we thought that Niamh had had her share of health problems. However in November 2005 when she was aged 5, she woke up one morning completely blind. We spent several weeks in hospital where they diagnosed a type of optic neuritis that basically means inflammation of the optic nerves. At the same time they also found a type of brain tumour called a PINEAL GLAND TUMOUR. This was monitored by the doctors and isn’t requiring treatment at present. They were unsure if this was connected to the vision loss. Niamh returned to mainstream school and started learning Braille in January 2006 and has coped well with her problems. Her eyesight did begin to improve but in May 2006 she had a second attack of OPTIC NUERITIS. It has been a very scary few months for us but she has coped so well and adapted to everything. She truly is a little star and an inspiration to us all. Sorry we haven’t updated for quite a while. Niamh, Kiera and Dylan enjoyed a great Christmas. Thank you for their lovely cards and gifts. Niamh is doing well at present and has been relapse free for 4 years this month. We can’t quite believe that, it is amazing. We still have ups and downs and the horrible medication but it is quite an achievement. Thank you all for your ongoing support. We are going to see Justin Bieber in a few weeks and the girls can’t wait. Niamh didn’t have a very good October and spent the early part of the month in and out of hospital. The good news is that she is now well and recovered from a very bad viral illness which the doctors initially thought was a relapse. Niamh was getting very tired and almost constantly sleeping as soon as she got home from school each evening for around 2-3 weeks and this is very unlike her. This led to lots of the usual tests, investigations and blood samples. Niamh, as usual, was amazingly brave. A great achievement was that Niamh had her very first MRI scan whilst awake. She has had all her previous scans done under general anesthetic. This time though she managed to do it whilst awake. I am not sure who was most scared (me, her mum, or Niamh). After getting very upset and taking medication to try and sedate her (which didn’t work) we eventually got the scan done. She was very brave (it is very noisy in the scanner, I thought it was about to blow up) and she needed to be very still for long periods of time. She was so proud of herself afterwards and has said she wouldn’t be worried if she had to have another MRI scan. The good news was that there was nothing on the scan to indicate a relapse. She also developed a nasty itchy rash which we later discovered was part of the viral infection. As well as all this, Niamh’s granddad passed away last week. She has been very upset about this as it was only 11 months ago that she also lost her grandmother, so we have had a pretty tough few weeks. I am travelling to LA next week on Niamh’s behalf to attend a conference regarding NMO, the rare disease that she suffers from. It will be very exciting to meet others with the same illness. The incidence in 1 in 100,000 current cases and new cases are 1 in 1,000,000, so it’s pretty rare and even more unusual in children than adults. It is a great opportunity for me though and has been funded by The Guthy Jackson Charitable Foundation in the USA. I will update you when I get back. Niamh and Kiera enjoyed a great birthday – thank you for their lovely cards and gifts. Niamh is doing well at present. Her recent eye check up showed no change which is great. Niamh loved her Post Pals pillow case of Hannah Montana. It has pride of place in her newly decorated Hannah Montana themed room. Niamh’s ct scan for her nasal problems was clear, so her doctors are trying a lose dose of antibiotics for several weeks to see if this helps. Niamh spent a day at the children’s hospital in Oxford during the school holidays. She wasn’t very happy about losing a day of her holiday to visit the doctors. The visit was worthwhile as she was reviewed by a specialist NMO team who will be contributing to her care in the future. She also had a very new type of eye scan that may help in the future should her eye sight deteriorate. Her antibodies for NMO in her blood were also examined and as usual she was very good about getting her blood taken – a huge 5mls was needed which is quite a lot. We can now relax now and think about our holiday. September will involve a few more hospital appointments though. Niamh has continued to do well the past few weeks. She still has lots of blood tests, investigations and doctors’ appointments. She is due to have a ct scan on her nose and sinuses next week as she’s been having some nose problems again. She has just had lots of bloods done that need a repeat in 2 weeks as well, but she is always so brave. She is working hard in school but really looking forward to the six weeks school holidays. We are visiting friends in Arizona for a few weeks in August and can’t wait. The success of the Russell Howard show has really shown in the increase in mail etc that Niamh has had. Thank you all for taking the time to help in this worthy cause. Niamh has had so many lovely gifts, emails, cards and letters the past few months, there are too many to mention, from far and wide. She loves to read through her weekly post as it arrives and it always brings a smile to her day. She particularly loved the Zookey sock teddy that came from New York, thank you Susy for that. The new year is here and we hope Niamh continues to be in good health for the rest of 2010. Niamh is doing well and has a few doctors’ appointments and investigations planned in the next few weeks, so please wish her luck. She has been working very hard in school and is now learning touch typing as well as Braille. Thank you for the lovely art set and cards that Niamh had to cheer her up in January. We had a wonderful Christmas. Niamh had lots of wonderful gifts and cards from Post Pals. Thank you all for every single one as she loves reading them all and opening the gifts. Thank you to our elves as well. The bath bomb polar bears were a great hit although it was sad to see them melt and she also loved her audio cds. We opened her gifts on Christmas Eve as we always do. She has some great surprises from Santa as well. We went to see Miley Cirus (Hannah Montana) in December and we had a wonderful time. We were very lucky to be moved to really good seats so Niamh was able to see a little. We hope that the New year goes well for all our Post Pals friends. Happy New Year. November has been a very busy month for Niamh. It was her brothers first birthday and she really enjoyed this and loves having people around to visit. She is still doing really well health wise but we just wish she would gain some more weight. We have a few check ups to come and a visit to the Dietician this month. School is going really well and Niamh is learning to touch type as well now. Thank you everyone for Niamh and her sister Kiera’s lovely birthday wishes and goodies. Hi everyone. I have had a lovely summer and I spent most of it at my nanny’s caravan near the seaside. So I have had lots of fun and fresh air. I have been well and I’m due to see my doctors again soon. I have moved to junior school as well. I am very excited as it is my birthday soon on September 14th and it is Kiera’s on the same day. We can’t wait. I am going to Legoland next weekend with tickets from Post Pals – THANK YOU! Then I will have a party at home. We are also going to see Hannah Montana in concert in December and I am so excited. Thank you for all my lovely post and I loved the Jacqueline Wilson audio book CD I was sent. Thank you so much. Niamh has been unwell with shingles but is now recovering from it. She is loving the weather we are having and is looking forward to a few weeks off school and enjoying the summer. Thanks for all her post which she really enjoys getting. After doing so well for such a long time, Niamh has had an eye test which shows a slight deterioration in her sight. Her doctors think this means she has had a slight relapse. So next week in half term she will be in hospital getting intravenous steroids for three days. She isn’t looking forward to this so will need some extra smiles to cheer her up. The steroids have horrible side effects as well and she hates the needles. Otherwise she is doing really well and loves her new baby brother, Dylan. Niamh had a wonderful Christmas. She did become unwell and spent a day in hospital on the 28th December, but recovered with antibiotics. Both Kiera and Niamh would like to thank you all for the lovely gifts and cards. We have a tradition now of having our Post Pals Christmas on Christmas Eve and open all the postie gifts then. Kiera and Niamh are very proud to announce their new little brother, Dylan Samuel, just in time for Christmas. He was born by c-section on the 24th November. He is a perfect addition to our family. Niamh loves him to bits and she’s a proper little mother and helper. The girls had a lovely birthday, thank you all so much for their lovely cards and gifts (see below). We also went to Thorpe Park for the day with the tickets given to us by Post Pals and had a wonderful day. It is now only just over 4 weeks until the girls’ new brother or sister arrives. Mum is having a C-section on 24th November and we are all very excited and busy preparing. Niamh is still on all her meds and doing well, but we still need to fatten her up a bit. Special thanks to, KIM BOWS, HELEN BRIELEY, JULIE BARRET, K WINCH, LINDA B , ST MATHEWS SUNDAY SCHOOL TORQUAY, KATE DEE, SARAH KIDD, AND JENNY PENZANCE. The girls received some lovely gifts and cards from you all, thank you. Niamh is doing well and looking forward to school. She is also looking forward to hers and Kiera’s birthdays on the 14th September. We are doing the Post Pals Thorpe Park Trip as part of their birthday treat. Niamh is continuing to do well health wise and our doctors appointments are 3 monthly now. Niamh and Kiera are enjoying the summer holidays even if it is rainy. Their mums bump is getting big and they are getting more excited. They both have birthdays coming up next month as well and can’t wait. Many thanks to you all for your cards and gifts, especially Katie Dee and Jennifer Castle. Niamh is doing well. We have been to parents evening and were very proud to hear how well she is doing with her Braille. Niamh is learning Welsh Braille, so if there is anyone out there who does Braille in Welsh we would love to hear from you. Many thanks to you all for Kiera and Niamh’s lovely gifts and letters this month. Special thanks to Katie Dee as Niamh loved Pooh bear and also to Jennifer Castle for all your lovely letters. Keep up the good work. We have returned from Florida after having another amazing holiday there. If you get the chance go it is amazing. I think we enjoyed it better this year as Niamh was a lot fitter and feeling better than during last years trip. We had a scare prior to going as Niamh was in hospital for a few days with an infection, but luckily she still went and was well there. She was a very happy girl in Florida and we got to meet lots of characters (including Minnie Mouse) and a few more dolphins (her favourite). Health wise Niamh is doing okay and still taking her immunosuppressant meds. At present we are really struggling with her weight, she is seeing the dietician but losing weight. It’s very hard to encourage her to eat. Other wise all is well. Another important bit of news is that we are expecting a baby sister or brother for Niamh and Kiera in November and they can’t wait! Thanks you to Katie Dee and everyone who has sent cards and gifts to both Kiera and Niamh in the last few weeks. It is always appreciated. Niamh has had a very good few months and she has finally stopped her steroids this month. This will be the real test to see if she remains relapse free without steroids and only her immunosuppressants, so please keep everything crossed for her. We are also planning to revisit Florida in early May as the girls enjoyed it all so much last year. Thank you for all the post. Niamh had a wonderful Christmas and really enjoyed getting her posties along with her sister Kiera. It really meant a lot to them both to receive all the wonderful gifts and cards from their Post Pal friends. We had an early Christmas where they opened their Post Pal gifts on Christmas Eve, which they thought was wonderful. Niamh was very impressed with the cards she received from Rudolph and his friends. Niamh has made really good progress this past year, much better than we could ever have hoped for. She continues to take immunosuppressants and is on a low dose of steroids. She is growing very slowly and we are trying to encourage her to gain weight, although her appetite is poor. We are hoping to stop the steroids in another 10 weeks, fingers crossed. She will be in hospital this week for a day and needs to have a needle in her hand for a few hours for tests to make sure her body hasn’t got dependent on the steroids. So we are hoping that will go well. Wishing everyone a happy and healthy New Year and thank you all again for your kindness. Special thanks to Wendy, Andrew, George and Anna Pettifer from Australia, Despina from the USA, Maria and Michael, Jenny, Helen, Jenn, Martin, Jackie and Jamie, Laura H, Ruth and also Craig and Abby for their lovely presents. More thanks to Julie Barrat and family (Niamh loved the seal) Maria Carney, Emma Hoole and Helen Brierley. Niamh is doing really well and looking forward to Christmas arriving. She is already making her list for Santa. She loves getting her posties, so keep up the good work! Niamh is still doing well and looks forward to school in September. She is also looking forward to her and her big sisters birthday, which they share on September 14th. Thank you all for your cards and smiles. Thanks again for all our lovely post pals gifts, love Kiera and Niamh. Niamh continues to do well. Her recent MRI scan was stable and she is weaning down her steroids. She is looking forward to her school holidays as well. Thanks to all our post pals. Niamh has had a wonderful month after her holiday in Florida. Niamh has been really good with yet more tests and investigations at the hospital. June 14th she is to have an MRI scan to check the pineal gland tumour and the areas on her spine caused by devics. She will be in hospital for a day for this. Wish us luck please. Thanks to everyone, especially Kat, for all Niamh’s post and the wonderful mystery gift for her sister Kiera. Niamh had a fabulous holiday in Florida Disney World. It was a well earned rest for us all. We met all the princesses and had breakfast with them. We also went swimming with dolphins which Niamh loved. We have a consultant review next week which will probably involve a change in medication and a few more tests for Niamh. We also have a CT scan booked for 14th June so think of us then. She has to have a general anaesthetic for that. We have lost count now of how many times she has been put to sleep (at least 15) and she’s always so good. Thanks Julie and Mari for remembering us again and to all our overseas posties. Niamh has had a good month and is looking forward to her visit to disney world on the 29th of April. Her vision seems stable and pretty good at the moment. She is learning everyday to make better use of her vision and amazes us daily with her abilities. We have an appointment tomorrow with a Professor from Great Ormond Street who is visiting Wales and is reviewing Niamh’s case. We also have a check up with the ophthalmologist this week. Thank you to Julie and Mari for your lovely cards and thank you so much to Corrine for the fabulous gifts from the USA, the girls loved them. Niamh is doing well at the moment; she has loved getting her post. She is going on holiday in April to Disney Land Florida.